Ram's Hydraulic Throwout Bearings offer efficiency and flexibility when setting up the clutch release system on performance cars and trucks (ideal for vehicles that can't accommodate a mechanical linkage or Circle Track cars with stock clutch). HD versions are the most durable compared to OE hydraulic systems, and full adjustability means easy installation on aftermarket clutches (single or dual disc). Bearing assemblies are available for universal applications, including Muncie, Saginaw, Borg Warner, and Tremec transmissions. The bearings have a floating design and require a minimum 3/4'' master cylinder bore with -3AN feed line to run from the master to the bearing. HD bearings also have larger O-rings and back-up rings for improved strength on street-driven vehicles. 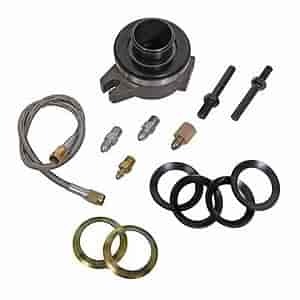 For cars like Mustang, Camaro, and Corvette, hydraulic bearing kits are offered that include the HD bearing assembly plus all lines, fittings, and adapters needed to connect the bearing to the factory master cylinder. Quicker release/engagement, increased travel, and adjustability make RAM Bearings an excellent choice for late model muscle cars. Will this work on a 1989 Camaro T5? Yes, this is a universal kit that should work on your Camaro transmission. Will this fit a 1975 Borg Warner Super T-10? Yes, this should work on your Super T10 application.